What is "camera ready" art? "Camera ready" refers to art and copy that is ready to be transferred to film without any retouching. Retouching includes art that has to be redrawn or reworked on the computer or by an artist. How do I obtain camera ready art? If you have had anything printed before, such as business cards, letterhead, etc., you can ask your printer for their files. We can also request your logo from your printer. Keep in mind that we must wait for the printer to send us what they have before we can process your order. What if my artwork has more than one color? Please send only original, native vector, EPS files. We cannot accept art files from the following Mac or PC platforms: BMP, Photoshop EPS, JPG, GIF, PICT, or TIFF. Do not attempt to save these files in an acceptable format. We cannot guarantee that files will be acceptable or usable if sent from PC platforms in formats such as BMP, GIF, PICT, or other. PC files such as DOC, EXE, PCX, PPT, P65, or XLS are not acceptable as these file formats are generally low resolution, only suitable for viewing on-screen and not for printing. These cannot be appropriately modified. However, if your item is to be embroidered then we can use a low quality graphic. .ai (Adobe Illustrator) This is usually* considered good art. All fonts must be converted to curves or outlines. Please save in PC format. .cdr (Corel Draw) This is usually* considered good art. We can use Version 11 or lower. Again, all fonts must be converted to curves or outlines. Please save in PC format. .eps (Encapsulated Post Script) This is usually* considered good art. An .eps is a universal vector art format; however, if you or your printer are Mac-based, you must have the .eps extension on the end of the file to ensure that we can open it. *We say "usually" because the below formats can be embedded in the above files and saved as the above files, but the "bad" art is still in the file and it would need to be redrawn. We always need to open the files to see if your art is useable or if it needs to be redrawn. 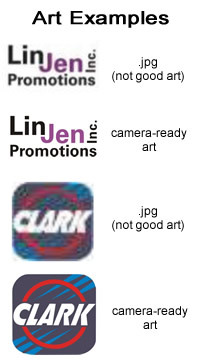 .jpeg, tiffs, Word documents, PowerPoint, and bitmaps all need to be redrawn. We need to see the art to quote an art charge. .pdf (Adobe Acrobat) files usually have to be redrawn unless they were originally created as camera ready art and saved in a format that we can extract the vector art. Please note that Adobe Acrobat is required to open pdf. You can download this free program by clicking on the icon below.